← We made it! We are full time RVers! The Good – We are currently at a beautiful site on the lake at Winchester State Park. After a walk around the lake, I rode my bike into town for a few groceries. This is really the first time we can see our future full-timing and it looks good! Over the weekend we spent great time with Natasha, Seth and Archer, my parents and my aunt and cousins at Union Campground between Baker City and Sumpter. We all love the campground. Campers among you should check it out. Archer was a super hit with family that hadn’t seen him in a while, or seen him yet. OK, he was a hit with us too! That leads to the Bad, and the Dirty….One of the things we were going to do this weekend was to deliver my Audi to my mother. I had said numerous times that I was glad she was taking it so I didn’t really have to get rid of a car I loved in this “dispose of almost everything” process. She sold her car last week in anticipation of getting the Audi. On Friday as we were preparing to leave town, we dropped the truck and trailer off to get new tires. I dropped Randy off at Banbury Golf Club for a tournament with his buddies. I had a few errands to do, including washing the car in preparation for giving it to mom. As I drove up the hill on Eagle road the Audi lost power and had to limp into the Target parking lot. To make a long, painful story shorter, my Audi came to a dirty (It was never dirty!) inglorious end at a salvage yard. The timing chain blew the engine and my car was done. I’d like to think someone will put a new engine in it and it will go on, but it wasn’t going to be cost effective or time effective for us to deal with it. 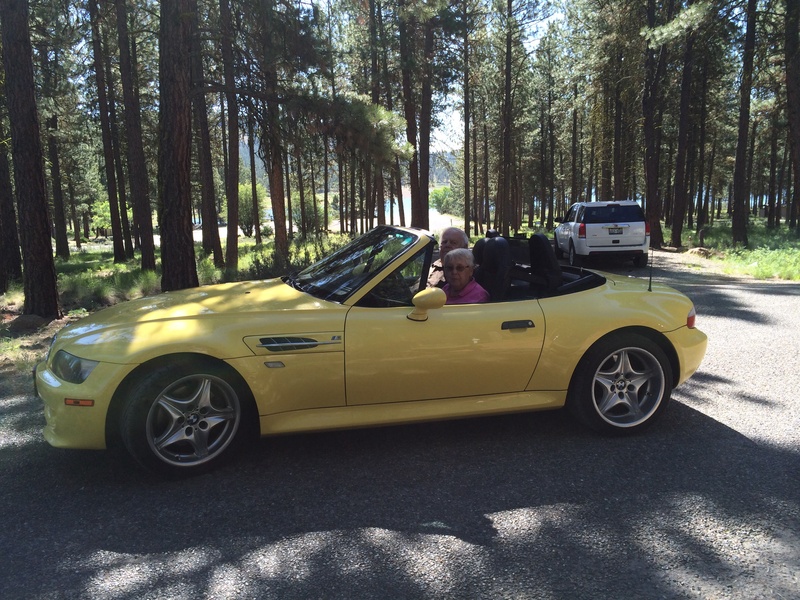 My parents, down to one car, decided they might like to try Randy’s BMW Roadster which had been for sale for several months. We picked it up at the consignment lot and left for Sumpter Friday late afternoon. In the end they decided they liked the idea of having a fun little yellow car and took it home to Vancouver. So, except for my car, all is well that ends well. We do feel very fortunate that the car gave it up while we were still in Boise, while the great folks at Boise Audi could help me trying to deal with this by myself (Randy was on the phone a jillion times) and while neighbors Gary and Judy could take Elko for the day. It would have been far worse for the drama to have happened while we were on the road to Sumpter or while my parents were on the road to Vancouver. Blessings can come in strange forms! I’m the Mom. We love the BMW, our new fun car. It was a great weekend! Loved seeing everybody again, cannot wait until the next one! Sounds like you are on your way to your next adventure! Everything does usually work out. I love the pic of the car. Sorry about your car! Looks like your parents are enjoying the other car. Looking forward to seeing you! Audrey.